This wonderful trip to the Bulb Flower District comes recommended from April to mid-May. This is the period you’re most likely to strike lucky and see the tulip fields in full bloom, although nobody can predict exactly when spring will set in. Opening times for world-famous Keukenhof park vary slightly each year but fall roughly within this timespan. The historical cities of Amsterdam, Leiden and Haarlem are great places to spend an evening, at a pavement café perhaps, weather permitting. On the first cycling day, don’t miss Cruquius (1852), a steam-driven pumping station, built with attention to aesthetic detail, and an important part of our industrial heritage. It was one of three pumping stations devised to drain Haarlemmermeer lake (170km2) which had the nasty tendency to expand and eat up more and more land and villages. The result was vast Haarlemmermeer polder which now harbours Amsterdam Airport, four meters below sea level. In the afternoon you will catch your first glimpse of the tulip fields. The second day of cycling is dedicated exclusively to those famous floral scenes, so you can enjoy them to your heart’s content. 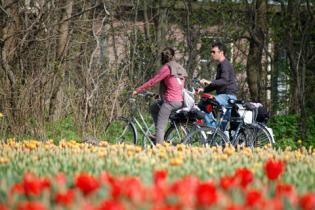 The route is quite short allowing for time to visit Keukenhof park. The last leg of the tour takes you from Leiden right across the green meadows and glistening lakes of the rural Green Heart region to Uithoorn . From here the lovely River Amstel will be your guide back to Amsterdam. Discover the province of Zeeland by bike from Duin Hotel Burgh Haamstede. Duin Hotel is in a blissfully peaceful location in the dunes, a 30 minute walk from the beach.